On Tuesday, Hillary Clinton became the first woman nominated as a major party presidential candidate. It was a historical moment in the United States, and despite the controversies around this election, it cannot be underplayed. Unless you’re designing the front cover of a major newspaper on Wednesday. 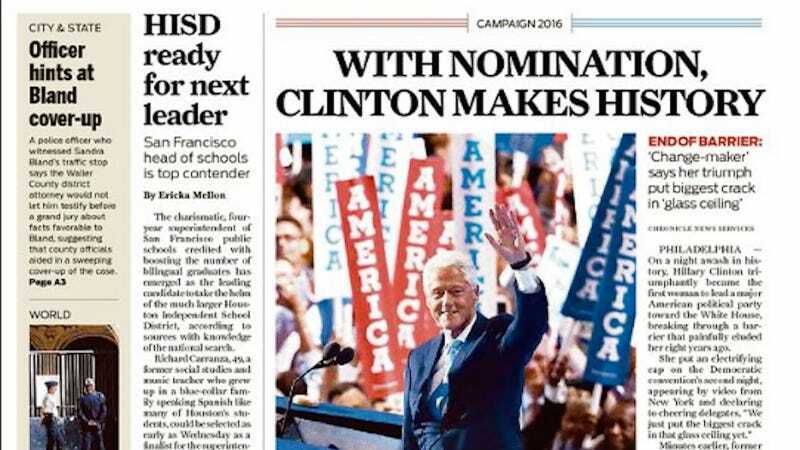 For many huge publications, the lead story was Hillary Clinton’s big win, but they tried their best to take the face of the woman making history completely out of it. The Wall Street Journal, for example, went with a photo of Bernie Sanders. Simple, elegant, to the point. Many others seemed to have Googled “Clinton + president” and come up with an image of Bill. Look, pictures of old white men sell newspapers. Love the player, hate the game.